Most readers here will be familiar with the plight of the Spoon-billed Sandpiper, a critically endangered wader that nests on the Russian tundra and winters in Southeast Asia. With populations plunging dramatically over the last decade, researchers from the Wildfowl and Wetlands Trust, Birds Russia, and a number of other conservation organizations made the always-controversial call to pluck eggs from the imperiled wild population and establish a captive breeding program as a final hedge against extinction. One of the great difficulties with a captive breeding program is how to avoid making things worse. In this instance, a team of crack experts assembled to move with precision timing in the face of bad weather, magnificently hostile terrain, and primitive facilities, all in order to give the collected eggs the absolute best chance to become healthy, breeding Spoon-billed Sandpipers in their own right. Said team of experts brought along a video camera. 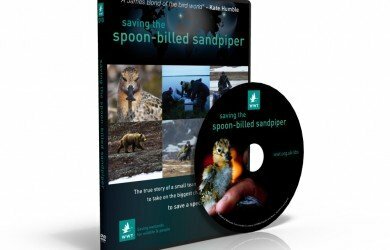 Saving the Spoon-billed Sandpiper is the result. Such weaknesses as there are actually come more on the storytelling end. While the project itself provides a vivid and compelling narrative arc and makes the film an overall success, the short length (the film clocks at a brisk 60 minutes) and what feels like post-hoc editing leave some information gaps that are likely to make a curious viewer itchy. Our introductions to the field team are jumbled, and only a handful of the researchers come through as real characters – most of all Nigel Jarrett, whose journey into the world of sleep deprivation is vivid on his face as he provides round-the-clock care for the eggs, and later chicks, on which so much depends. Worse, from my perspective, we get relatively little context for the project — we see a predated nest but never learn what the Spoon-billed Sandpiper’s natural predators are, we see the village where the team sets up their base but learn more about the dogs than the people there, and worst of all, we learn that there’s a great risk of mortality to the eggs and chicks but never find out how many, exactly, don’t survive. But despite all that, as I said, I would consider this picture a success, especially considering the challenging conditions under which it was filmed. The footage of the hatching and growing chicks alone, for instance, is well worth the price of admission, representing a sight that most of us will assuredly never see, something that one of the researchers tearfully describes as one of the great moments of her life. And being both concise and dramatic, as well as full of adorable baby birds, this might be a good choice for non-birding audiences in classrooms or recreation centers as well. Thanks for the nice review. I was about to go and see Spoonies in Korea but then sadly, work life got in the way. Big mistake! With “I was about…”, I meant “12 years ago after university”. @Jochen: Only 12 years ago? @Corey: yeah, I was a late-bloomer.